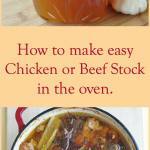 How to make chicken stock or beef stock in the oven. 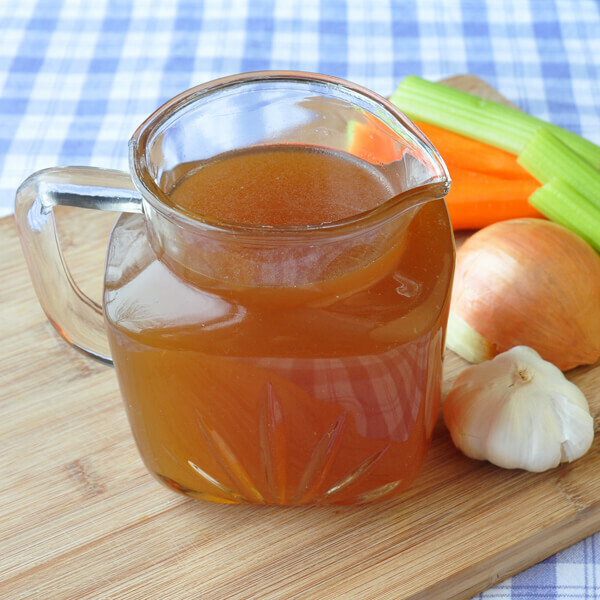 How to save time & money while making the best stock for soup, stew and gravy. 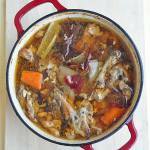 I have often talked about making homemade stock over the years here on Rock Recipes. I sometimes refer to myself as a collector of bones because it sounds humorously macabre. 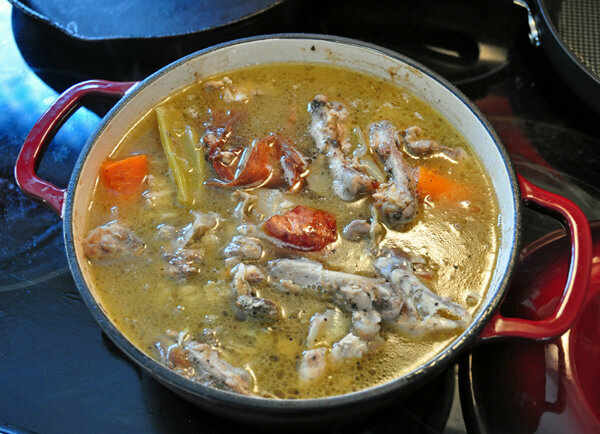 The truth though is that saving bones from trimming chicken and beef is a great way to make the best, richest flavoured stock for soups, stews, gravies and sauces. Supermarket stock is great in a pinch but nothing beats homemade where you can control the amount of salt and seasoning to suit your own taste and purpose. For so many reasons it really is worth discovering how to make chicken stock at home…or any stock. Of course you can always ask your butcher for bones but I also collect bones for stock in several ways. I often buy whole chickens and break them down myself when I need chicken parts. I very often buy bone-in chicken pieces and de-bone them myself as well, especially when they are on sale. When buying beef for a soup or stew for example, I will buy cheaper, bone-in cuts like blade roast and trim and cut the beef pieces myself to save the bones for later. Currently, because of a recent great sale at the supermarket, there are a bunch of t-bone steak bones in my freezer waiting to be made into stock. I cut the strip loin steaks off the larger side and the beef tenderloin off the smaller side and freeze the bones. I often freeze the tenderloin fillets for the weekend because it’s my favorite cut to use for steak and eggs at brunch. Bones from carving a bone-in roast or from a roast chicken carcass also make their way into my stocks. I treat them exactly the same as I would uncooked bones, very often combining the two at the same time; nothing gets wasted around here. There are always a couple of large Ziploc bags in my freezer to which new bones get added as they are collected. A large Ziploc bag of bones will yield 1 1/2 to 2 quarts of stock in my experience. My favorite way to make stock is in the oven. My favorite way to make stock is in the oven, most often when something else, like a pot roast, braised chicken or baked beans is being cooked at the same time. This is more economical, saves energy and except for the cost of a couple of veggies, results in delicious stock for practically no cost or extra time dedicated to making it. It’s a really efficient way to make stock with practically no extra effort. I always roast off the bones with the vegetables I’m adding to caramelize them for better flavour and colour. You will always have better tasting stock this way. The roasting, along with the slow even simmer in the oven also makes for a more clear broth. It is important to very lightly season the bones before roasting. Use only a fraction of the salt and pepper you would normally use. You want only enough to bring out the meat flavour while roasting; remember the end use of the stock will see extra seasoning and very often the reducing of its volume in many recipes. Therefore, you don’t want to further concentrate the salt content when using the stock in your cooking. Many people I know make their stock in a slow cooker, which is a great idea too but I would still roast off the bones first to ensure the best flavour and colour. Especially when making chicken stock, a tip I learned years ago from a saucier who worked in a fancy hotel kitchen, was to leave the onion skins on during the cooking time. The skins give a natural light amber colour to the broth as it cooks and that always looks much more appealing than cloudy, pale, anemic looking stock. 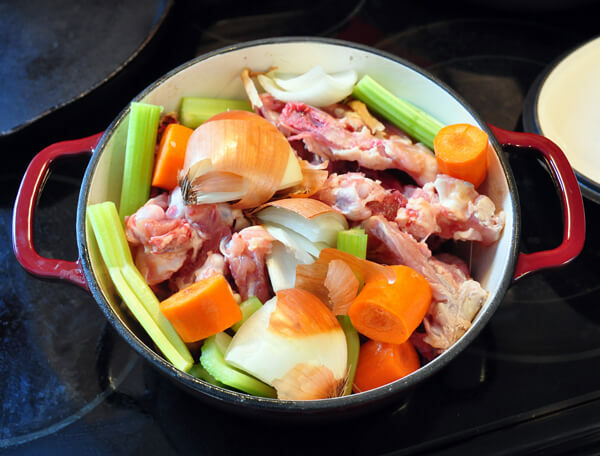 So go ahead, become a collector of bones yourself and get into the routine of making your own stock when making slow cooked meals in the oven. Once you get into this low effort method, you’ll wonder why you never did before. Like this “How to make chicken stock” recipe? It's so easy to easily make chicken or beef stock in the oven at the same time as slow cooking or braising something else. 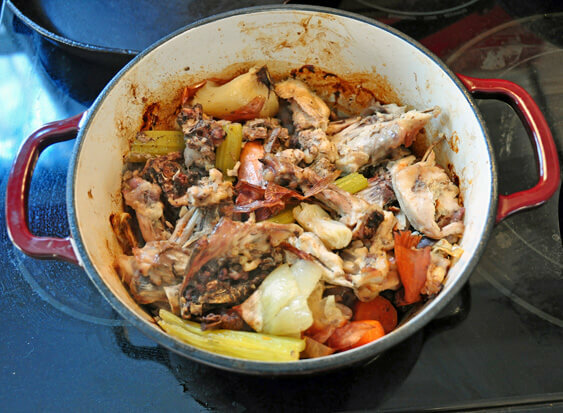 Toss together all the ingredients in a small covered roasting pan or in a heavy covered dutch oven. Cover and roast at 350 degrees F for about an hour. Pour about 10 cups water (2 1/2 liters) over the roasted bones. cover and return to the oven for about 2 hours. Check it a couple of times. You may have to add additional water during this time to ensure the bones stay covered. Use a fine strainer to strain the stock off the bones. Skim the fat off the surface. You can chill the stock overnight for easy removal of all the fat if you like. Freeze in 16 ounce airtight plastic containers. Pinning your recipes like a mad woman (which I am). Can’t believe I haven’t been roasting off the bones all my years! I too am a bone collector along with leftover cooked meats. I also have a mesh bag I keep all our onion skins in. I add all of them each time I make Chicken broth for wonderful colour.. Thanks for your blog! What does “roast off” mean? I also keep all of my veggie and herb scraps in a bag in the freezer – carrot ends, onion peels and ends, herb stems, etc. – and use these along with my bones for stock. Zero waste solution. Thank you for the roasting tip – I have been making stock for some time with scraps, and never thought of or heard about this technique! Thank you for all your great recipes too!